Several years ago, I wrote about various methods for pitching our story. At the time, I was thinking mostly about traditional publishing, so my perspective was someone looking to pitch to agents, including queries and “elevator pitches” (a story pitch short enough to give during an elevator ride at a writers’ conference). However, story pitches are used for self-published books as well as traditionally published books. No matter how we publish, we need to introduce our story to potential readers and interest them enough to want to look closer. We might use a short elevator-style pitch sentence to start off our book description and back-cover blurb. Or we might tighten and punch it up to come up with a front-cover tagline. We might also use our pitch at book signings, when potential readers wonder what we have to offer. One other word that’s often included with those applications above is logline. I didn’t include logline in the list because the word usually refers to a dry 1-2 sentence description of our story’s action that we might use to keep the gist of our story in mind during drafting and revisions. Be Visual: Back-cover blurbs and book descriptions usually include the main character(s) first name but shorter pitches often don’t. Instead of character names, create a picture with adjective-noun combinations (tax-evading fireman, vegetarian vampire, etc.). There’s no “perfect” pitch, so rather than trying to come up with something one-size-fits-all, I’ll touch on the various pitch-building methods out there. Some stories might lend themselves to certain approaches more than others. Remember, our point here is to try to build pitches using as many of these techniques as we can. The variety will help us see which elements stand out and make our story sound unique and interesting. Then with the strongest elements, we can reorganize those ideas and add voice to create a sales-style pitch. As I mentioned above, many of those above formulas are geared toward one-sentence, logline-type pitches. But once we have that sentence, we can expand it to create a longer pitch, like for a query letter. Cyndi Faria has a great post about how to turn a one-sentence hook into a five-sentence paragraph. Often the first step to coming up with a sales-type pitch is figuring out the essence of our story and seeing which elements are most interesting (like which of those “Focus” approaches bring out our story’s unique aspects). We can take the best elements of our story that we discover with a boring logline and punch it up with word choice, sentence structure, and voice to create something more intriguing. Julie Glover guest posted here a couple of years ago with her advice on how to take our blurbs and queries from good to great. She’s phenomenal (and helps me with all of my book descriptions!) and shares her tips on tightening, using power words, and including voice. As Julie mentions, we want to get feedback on our pitches because we know our story too well. Just last month, Jefferson Smith shared a resource on how we can get feedback on our tagline and blurb. Now What Do We Do with This Pitch? Once we have various-length pitches, we’ll find countless uses for them. Many published authors say they’ve had to answer the “What’s your book about?” question from far more people after they were published than they ever sent out queries or did formal pitches before they were published. What types of pitches do you enjoy writing the most? What are some ways you’ve used pitches? Have you started with a short pitch and expanded it? Or do you develop short and long pitches separately? Do formulas help you get started? Timely post. Attending a new writer meet up on Sunday about novels and undoubtedly will pitch my manuscript at some point. So once again you have given me great data when needed. Thank you Jami, the greatest humanoid, carbon-based life-form, writing being in three parsecs! I have been bingeing on veggies, push-ups, & Dark Matter sifi lately. Can you tell? Jami, You really out-did yourself on this post, it rocks! So many yummy nuggets of writerly wisdom. I can’t put it down. Thanks! What I find the most difficult is talking about my current work, when asked. After I write and revise and polish, I take the time to work out a tagline and blurb. But then people inevitably ask, “What are you working on now?” And my reply usually sounds like, “book, good, pages” or something similar. What I am realizing is that maybe I should figure out a line or two for my current work, and this post will really help with that! I particularly appreciate the array of areas to focus, as I think at this point focusing on theme, character, or question, is what I need to do. 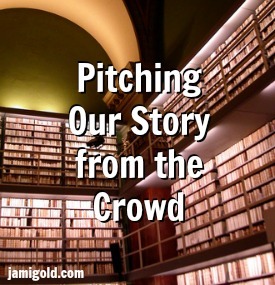 Most information about creating pitches doesn’t give us so many options and ideas. Thank you! This is the hardest part for me – condensing the story into a couple of lines AND making them interesting! I always dread the task. Thanks for a very helpful post! Dani, you’re right, it IS hard to write an interesting pitch. But it is definitely worth the effort. I’ve found that taking the time to condense my story idea is a great way to overcome writer’s block. And pitch to the right audience! I have a hard time writing these. Thanks for the help. You may have just saved my backside, as I am not good at writing any sort of pitches (I’m in the process of writing a description for something online at the moment, and it is harder than I thought). This is going to be really helpful, thank you very much for this pose Jami! Wow, this is a post that should get bookmarked by many writers! Lots of great advice and links. Thanks so much, Jami.